May 29th, 2015 will be ZOZOBRA Night at Fort Marcy Ballpark between the Santa Fe Fuego and Trinidad Triggers. 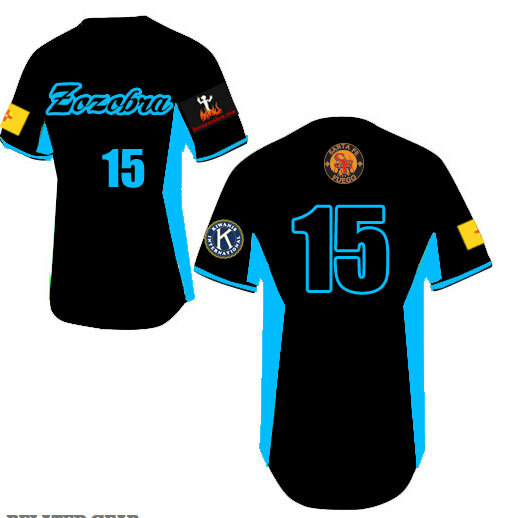 The Fuego will wear custom Black and Turquoise ZOZOBRA Jerseys for this game. ZOZOBRA is the official hat sponsor of the 2015 Santa Fe Fuego. Old Man Gloom will appear on the new all black Fuego Hats. After the game the jerseys will be sold and a portion of the proceeds will go to KIWANIS CLUB OF SANTA FE. ZOZOBRA ("Old Man Gloom") is a giant marionette effigy that is built and burned every autumn during Fiestas de Santa Fe in Santa Fe, New Mexico. As his name suggests, he embodies gloom; by burning him, people destroy the worries and troubles of the previous year in the flames. Anyone with an excess of gloom is encouraged to write down the nature of his or her gloom on a slip of paper and leave it in the "gloom box" found in the offices of the Santa Fe Reporter in the weeks leading up to the burn. Many people put legal papers in the gloom box as well. At the festival the papers from the gloom box are placed at ZOZOBRA's feet to be burned inside him. Fiestas de Santa Fe has been held since 1712 to celebrate the Spanish retaking of the city in 1692 by Don Diego de Vargas from the Pueblo tribes who had occupied the city since the Pueblo Revolt of 1680. The burning of ZOZOBRA dates from 1924. Santa Fe artist and marionette maker Gustave Baumann came up with the idea of creating the effigy, also called Old Man Gloom, and the ritual burning; and then conspired with his friend William Howard Shuster, Jr. to burn the first ZOZOBRA. ZOZOBRA means "anxiety" in Spanish. Baumann's idea might have been influenced by Mexican cartoner�a (papier-m�ch� sculpture), especially the effigies exploded during the burning of Judas that takes place on Holy Saturday or New Year's Eve, as a way of ridding oneself or one's community of evil. Today in Santa Fe more than 40,000 people go to watch ZOZOBRA, who stands fifty feet tall. His burning marks the start of a weeks celebration that includes traditional mass at St. Francis Cathedral; a reenactment of the Entrada, when Don Diego de Vargas returned to the city; a Children's Pet Parade; and the Historical/Hysterical Parade. The Kiwanis Club of Santa Fe builds Zozobra and burns the effigy at Fort Marcy Park. The Zozobra that was burned on September 7, 2007, was certified by Guinness World Records as the largest marionette in the world, measuring 15.21 m (49.11 ft) in height. Zozobra's record was subsequently broken by the 17.82 m (58.46 ft) mascot to Ottawa's Ital-Fest one year later on September 6, 2008. The Zozobra burning in Fort Marcy Park in Santa Fe, New Mexico has traditionally been held in September, however ticket sales in advance of the event improved when it was moved to the Friday immediately before Labor Day in 2014. Kiwanis International and The Kiwanis Club of Santa Fe mission is to improve the lives of children within our community and throughout the world. Over the years, through our major fundraising event, �Will Shuster�s Burning of Zozobra�, funds raised are donated back to our local community, Santa Fe, in the form of grants and scholarships. In addition we have a worldwide reach through Kiwanis International�s ELIMINATE project an international project to eliminate maternal neo-natal tetanus from the planet, a project The Santa Fe Club proudly contribute towards at the model club level.